If you have any questions or want to enquire about dates, use our form to contact Ben Dickins or see their website for more information. On the outskirts of tiny Saint Cadou in the heart of the Parc Naturel d’Armorique is a 17th-century presbytery flanked by two houses: a retreat of gites at the end of the drive. Not only are the gites beautiful and the detailing second to none but the hosts are hospitable, professional and unfailingly generous. Aided by a black cat and a springer spaniel (bring your dog if you want it to be spoiled) Ben and David have created a place of serenity and charm. The Priory, dating from 1640, oozes history and spreads itself over three floors, with a French hunting lodge of a sitting room, a dining room that seats eight and a fabulous kitchen opening to the garden. The Granary is a family cottage for six; the Hayloft and Stable are boltholes for two, both single storey, the latter a B&B studio. Everyone has private outdoor space, logs are on the house, bikes are available, breakfasts and dinners can be requested (local, seasonal, delicious) and owls hoot you to sleep. You can shop and eat in Sizun (7km); cycle on the Velo Vert; swim off golden sand beaches (and fly fish) at Lac du Drennec, a two-minute drive. Minimum stay: 7 nights in high season. Short breaks available. Pets by arrangement. Cot available. Facilities may differ in smaller gîtes, enquire with owner. Dinner, 3 courses, €70 by arrangement. Restaurants 3km. We had a truly peaceful and relaxing holiday staying in Hayloft, a little jewel of a gite with lots of thoughtful touches to delight. Ben and David are lovely hosts, full of information on local things to do. We have seldom slept better and went to so many interesting places. 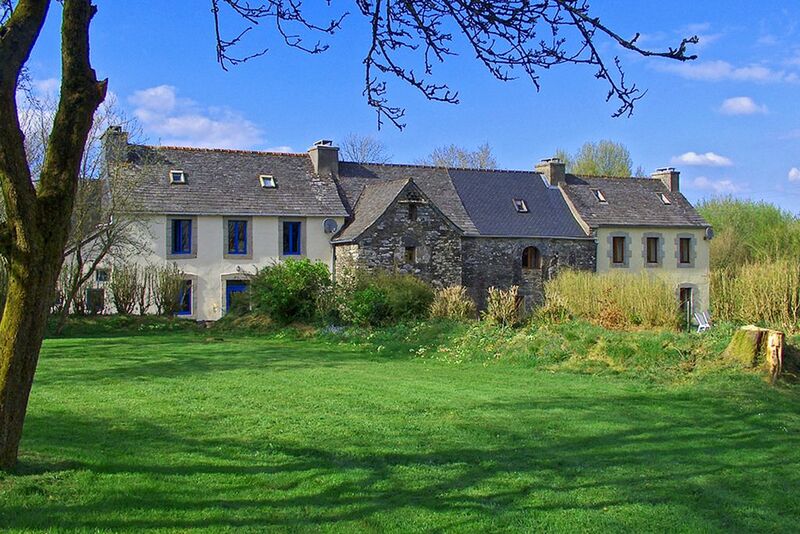 Kergudon gites are sited in the heart of the Monts D'Arree in a natural park. As such you are spoiled for choice for walking, cycling or horse-riding routes in stunning scenery including the highest points of Brittany with their breath-taking views. Equidistant from the north, west and south coasts of Brittany, each with their own character and charm, you can choose from long sandy beaches of the Crozon peninsular, the Pink Granite coast to the north or rockier inlets and estuaries of the south. While a small, rural village St Cadou is surprisingly active for a village of its size boasting a lively dog-friendly pub, boulangerie and active Comité des Fêtes. If you're here when one of the many Fest Noz's take place its definitely worth attending!